Forbes magazine estimates the value of the Saints franchise at about $1.1 billion for 2012. Drew Brees’ long anticipated (too long) new contract, if fulfilled in total, values him at about 10% of the franchise’s estimated worth, not ad infinitum, but over the next 5 years. In the forever, tired arguments that go with big time sports, including Division I college athletics, about is it a business or is it a game, or how much is too much, or not enough, besides the real answer – whatever the market will bear, if we are still in western civilization – this valuation is a unique estimation of # 9’s worth to the organization. Is Drew Brees worth 10% of what the Saints have become over the past 6 years that he has been here, or will become over the next 5? Based on what he brings to the table in terms of wins versus losses that soldifies a fan base and contributes to expanded revenue streams significant enough to alter a component of a franchise’s worth, the answer is a resounding yes. He is worth at least that, and then some. 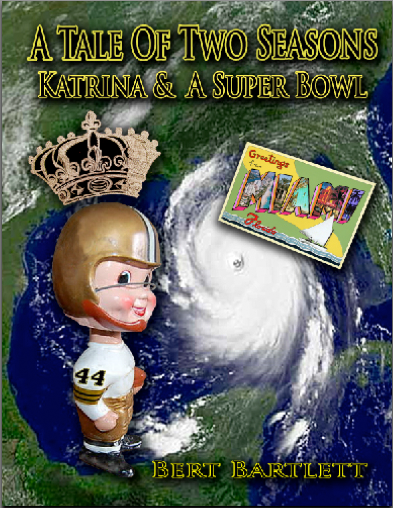 We haven’t, and surely Tom Benson has not forgotten, that Pre-Katrina, while the Saints were often mired in competitive mediocrity on the field and beginning to lag at the box office, with veiled threats to move, the Saints’ value was in the bottom third or fourth tier of the rankings when Forbes was taking stabs at appraising pro sports teams. And the main wailing as to why that was true back then – the “small market” of New Orleans – has not changed. In fact, “the market” has shrunk significantly since the storm. The Saints’ success off the field, in the coffers, has debunked all the qualified demographic forecasters and economists of the day, and yes, the franchise’s ownership and management, that saw much less than the bigger picture, especially the localized flavor of it. That’s an instrumental reason the Saints have been a good story. Besides the intangibles, his production in cumulatively leading the league in virtually every statistical category since he has been here (except Super Bowl titles) is only part of the reason why Brees remains a bargain. By intent, design, rule, and advertisement, whether it realizes it in full or will admit it or not, the NFL has become a made for the quarterback league, though it has not eschewed the team concept of the game as much as, say, the National Basketball Association, which long ago sold out to the star system in earnest to sell tickets and tune people in. Today, only curmudgeons are heard lamenting that there is no distinctive style difference in that game, or in the kind of basketball that used to distinguish how, say, the (fast) Lakers and the (slow) Celtics used to play. The year 2000 may have been the last time an “inadequate” quarterback was good enough to be a part of a team good enough to win a Super Bowl. Ugly duckling and poor statistic accumulator Trent Dilfer of the Ravens unfairly, and stupidly, was not even invited back to training camp to help defend a title the following season. The Ravens subsequently went by the wayside, with plenty of other also-rans. In football, it is a real credit to the intrinsic value of the generic game itself, regardless of who tries to alter it, for whatever reason, or especially, put a dollar value on it, that the brown leather pigskin and it’s myriad bounces symbolize the trumping of the human element for the last say – just when all the experts think they have a firm grip on it. And increases it’s appeal as veritable entertainment to the fan. Did it matter that Pierre Thomas was an undrafted player and on the low end of the compensation totem pole when he took a swing pass and careened his way into the end zone to put the Saints ahead of the Colts following the onsides kick in the Super Bowl? Did it matter that Jimmy Graham didn’t even play football in college, when he fantastically snagged a pass and split three 49’ers in galloping his way to the end zone to keep the Saints alive in the playoffs as the clock wound down? That what it demands from individuals and teams to play in the way of success continues to be elusively quantified by anyone with and without a vested interest in the game, and can’t ever be capsulized, though the league’s powers that be and the media would love to tell you otherwise. Yes, they love to try to tell you all about it, what and why it is, the way it is. Again and again. Old school coaches used to hark about the game’s character building or revealing aspects, or call it a mirror for life’s experiences itself. We’ll leave that to them. What we do know is that the game can take more than it gives to the people that play it, as well as watch it, and vice versa. And as Bountygate attests to, it can sometimes get ugly, as pretty as it can get when a team does The Right Stuff and puts it all together. It isn’t that football defies logic, but most tellingly, the game can be brutal, and brutally honest – to anyone who takes it for granted, in whatever capacity. If and when it ever appears that is less and less the case, the blog, Souls Of The Saints, will likely cease and desist. better win a super bowl in three years or it will be a nuclear or shall we say salary cap wasteland in New Orleans! The window hasn’t closed for Saints to win it again with this core of players yet but it is beginning to….